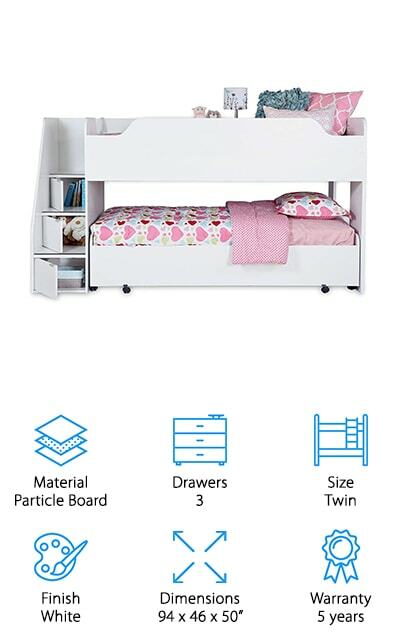 If you’ve been thinking about getting bunk beds but are afraid your kids are too little for a ladder or if you’re torn between a new bed or additional storage, do we have the solution for you? By choosing bunk beds with stairs, you’ll get both more storage and a safer climb to the top bunk. We researched some of the best-selling, top-rated models out there to put together this review. First, let’s look at some of the key features. Material: These beds are made of wood, MDF, or a combination of the two. Wood is best if you want to eventually separate the beds so your kids can use them as they get older because it’s the most durable. Drawers: Some of these beds have a surprising amount of drawer space. So much, in fact, that you might even be able to use them as a dresser. And get this, some also come with shelves for even more storage! Size: The most common size for bunks is twin over twin. Another great option is twin over full. The bottom bed is a little larger which is better for an older kid. It also makes a great addition to a guest room. Finish: Finishes vary slightly. You’ll find options in white, cappuccino, and natural shades. Some of them are available in a few different finishes, too, so take a look and figure out which one goes best with your room. Dimensions: These are the dimensions of the whole bunk once it’s assembled. One of the things you should not is the height. If you have low ceilings in your home, make there’s enough room for the kiddo in the top bunk. Warranty: Some of these don’t have any clear warranties at all while others are pretty impressive. Some are only covered for a few months but we also found a few with warranties that last 5 or 10 years. Now that you know a little more about what to look for, let’s get deeper into our bunk bed review. Here’s how it works. We put our top and budget picks right at the top of the list so you’ll get a good idea about the range that’s available. All of these bunks are unique in their own way so stick around through the end if you can. We think you’ll find something you love. Ready to get started? Let’s go. 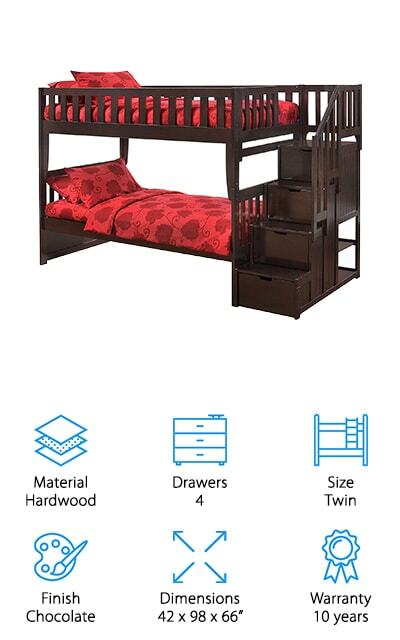 Our pick for best bunk bed with stairs is the Beds King Stairway Bunk Bed. One of the best things about it is that it’s a twin bed over a full. This is great if you have an older kid sharing with a younger sibling or if you want to have a nice bed for guests when they stay. This bed has a decent amount of storage, too. There are four drawers built into the stairs and two large ones under the bottom bed. That’s not all, this bed is made of solid Brazilian Pine that’s strong, durable, and kid safe. Assembly is required but all the tools that you need are included. One more thing, the mattress slats you need are included, too, so no need to buy a bunkie board. 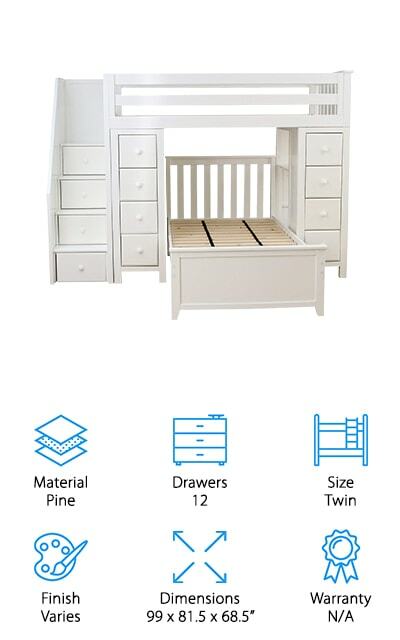 Next up is a good choice for cheap bunk beds. The South Shore Mobby Loft Bed is actually a loft bed. To turn it into bunks, all you have to do is use the twin bed you already have and, viola, an instant bunk. The best part? If you wanted a queen size bunk bed, you can easily fit a queen sized mattress underneath the loft. This is obviously a great bed for kids but it’s also a good option for a guest room since you can fit such a large bed underneath. There are drawers in the steps for some extra storage, too. That’s not all, to help your child stay safe during any middle of the night wake-ups, there are glow in the dark non-slip strips on the stairs. Atlantic Furniture is up next with the Columbia Bunk Bed, a sturdy bunk bed that was designed to last and last. It’s made of eco-friendly hardwood and has a protective finish to add durability. You can choose between dark antique walnut and bright right so this bed will suit any decor. One of the best things about this bunk bed is that it’s convertible. What do we mean by that? You can take it apart and make it into two separate beds if you want. That means it can really grow with your children, even when they decide they don’t want bunks anymore. 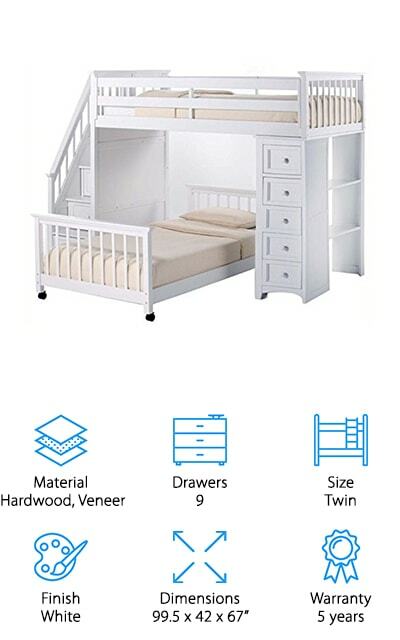 One more thing, this bed also includes a trundle, perfect if you need to get three kids in one room or the idea bed for sleepovers. Another bed that we really liked is the ACME Jason Bunk Bed. Why do we like it so much? It really gives you a lot of sleeping space. Here’s what we mean. First of all, this is a twin over full design so the bottom bunk is larger and more comfortable for older children or adult house guests. That’s not all, it even has a twin size trundle. This bed can sleep four people in all, as long as two are willing to share the full bed. There’s a lot of storage in this bed, too: six drawers of various sizes that are accessed from the side of the stairs. This bunk is made of pine wood and MDF and, because it’s available in both dark espresso and white, it matches just about any decor. 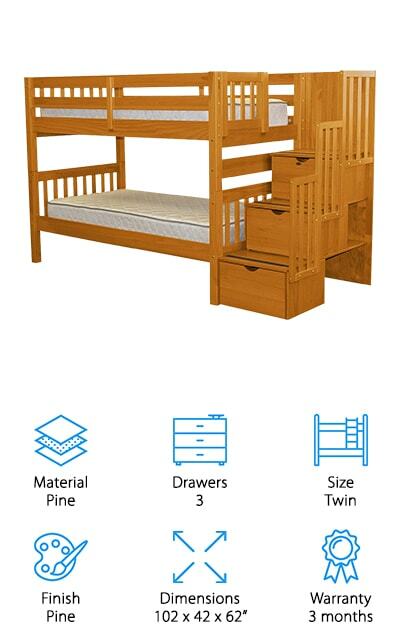 Bedz King’s Twin over Twin Bunk is a great choice if you’re looking for something that will grow with your child. It can be separated into two twin beds when your kids outgrow bunks or even no longer want to share a bedroom. The built-in stairway provides safe access to the top bunk. Plus, there are even three drawers built-in for additional storage. This bed is made of solid Brazilian pine. A protective finish is added that’s safe for kids and also allows the wood to keep its beautiful natural color. The mattress slats you need are included so you don’t need to worry about buying any additional materials. Assembly is required and, though it may take a while, it’s pretty simple. All of the hardware and tools you need are included. 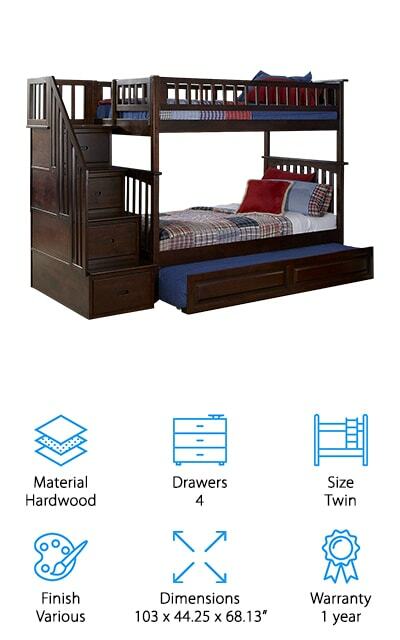 If you’re looking for a quality bunk bed that has a lot of storage, check out the Plank & Beam Staircase Loft Bed. The solid New Zealand Pine construction is strong and durable plus it’s available in three different finishes: white, natural, and espresso. This bed has grooved steps, 14-inch high rails, and rounded edges for safety. There is also an insane amount of storage. There are drawers in each of the steps as well as eight drawers in the narrow dressers on either side of the lower bunk. The lower bunk also has three shelves on each side and there are three shelves on the side opposite the stairs. In all, that’s twelve drawers and nine shelves! That’s not all, the lower bed isn’t attached so you can use it anywhere in the room. 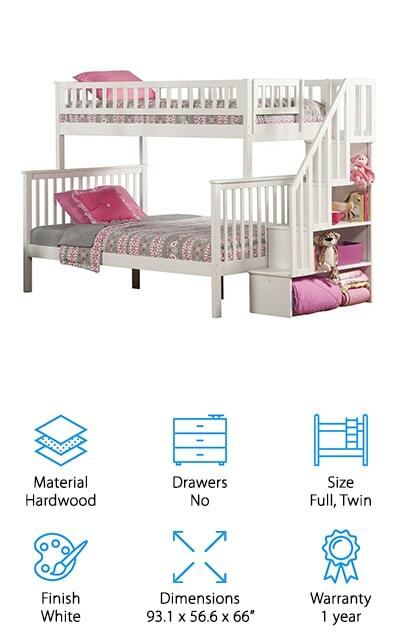 Another fun bunk bed that gives you a lot of storage space is the Pemberly Row Stair Loft Bed. 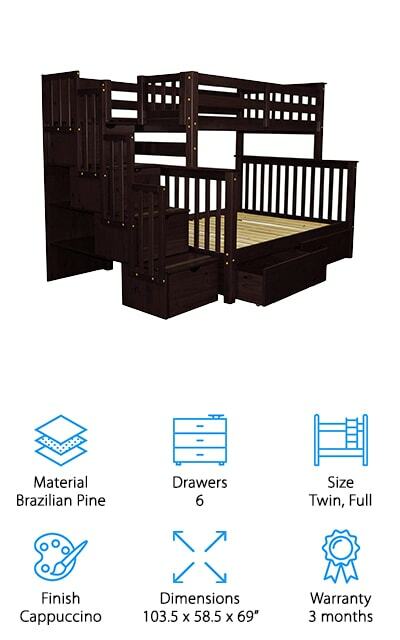 This bunk includes a complete slat system so you don’t have to get any additional materials. It’s mattress ready. This bed includes four drawers that are incorporated into the stairs as well as a five drawer chest that’s built into the frame. That’s not all, there are also two bookshelves for even more places for your child to stash their things. It’s constructed out of hardwood and veneer and has a clean, bright white finish that goes with any decor. Plus. the bottom bunk had wheels so it’s easy to move around. When your kids get sick of bunks, just roll it to the other side of the room or even a room down the hall. 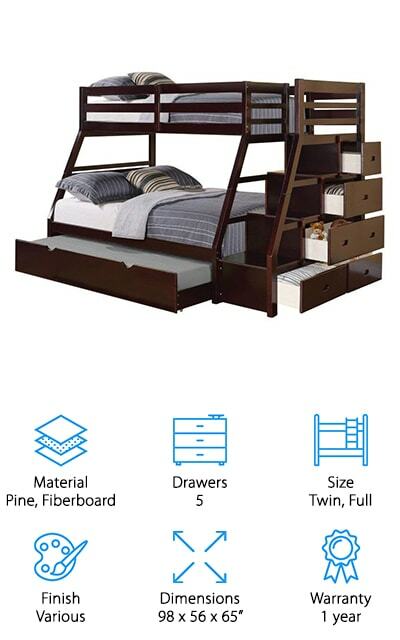 Our next pick for best bunk bed is the Donco Cappuccino Mission Bunk Bed. This twin over twin design is made of solid wood with a gorgeous cappuccino finish. A four drawer chest sits under the stairs which gives you a nice amount of additional storage. One of the things that’s great about this design is that you can reverse the stairway if you want to. Whether you need to have the stairs on the left or right side of the room so the bed will fit into any layout or room design. The mission-style design of this bed has a lot of great details, too. The vertical slats and panel detailing add a lot of visual interest. That’s not all, the silver knobs on the stairway drawers add a nice pop or brightness. Another full bunk bed design that we had to include is the Atlantic Furniture Woodland Bunk Bed. First of all, it’s made of eco-friendly hardwood that will last and last. It’s also coated with a five-step finish that keeps the surface protected and is kid friendly. You don’t have to worry about getting slats to support the mattresses, either, because everything you need is included, just add the mattress. 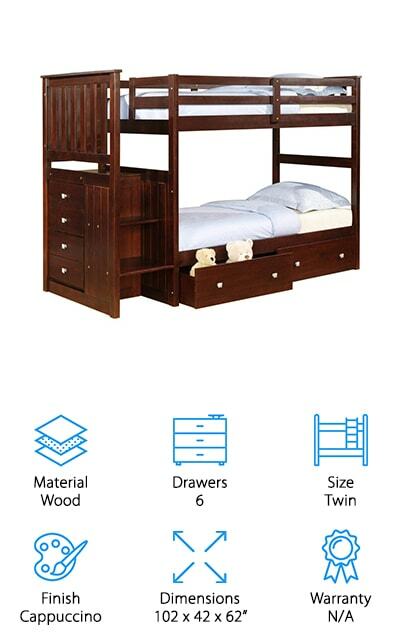 This bunk converts to two separate beds when your kids are ready. You can also place the staircase at either end of the bed so that it fits into any room. While this one doesn’t have any drawers, there are four shelves tucked away under the stairs where your kids can put books, board games, or stuff animals. Last but not least is the night & Day Furniture Bunk Bed. This bed can be put together with the stairs on the right or the left so you can easily arrange it to fit your room. The stairs easy have a large drawer in them plus there are hidden shelves behind them, perfect if your kids need a little extra storage in their room. These beds are durable and built to last a long time. In fact, they come with a 10 year warranty. Mattress slats are included and they’re supported with the brand’s special rail and foot support system. They’re built using hardwood and finished using various techniques, including hand rubbing. One more thing, this bunk does need to be assembled but the instructions are clear and easy to understand.